Really? The Hermitage? Again? Yes, we revisited one of the most over photographed areas of Scotland once more in the hope of something new and exciting. We got plenty of excitement when we realised how slippy the rocks were but that wasn’t going to stop me climbing to the best vantage points of the spectacular falls. There was plenty of light to be had but as usual none of it was falling on the right places. This of course allowed for slower shutter speeds but I could see sun was providing some beautiful vibrant colours through the polariser. Tourists were all over the place, drawn to the place like vultures over a dying animal but seemed to keep out of the way for the most part. I actually welcomed them in the picture to the right as it gives a sense of purpose and scale to the viewpoint building. It’s a great place to get wet! I was shooting in raw – something I find myself doing more and more often. My hard drive space is getting very low as a result. 80gb worth of photos and rising! The tripod was a god-send and a hinderance at the same time as it was switching between a walking stick and a cumbersome liability, catching on overhanging branches while I was clambering over icy rocks. I’m pleased with the results and as the American tourists said to us – “we’re glad you didn’t fall in” – here, here! Sometimes it’s good to go back to popular already photographed places, adds to a sense of challenge as you try to get something different from the norm. 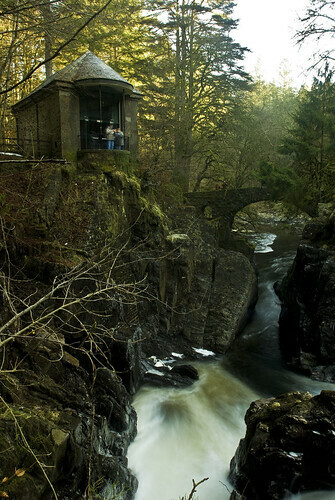 The hermitage just outside Dunkeld must be one of the most photographed places in Perthshire. But I always love a good challenge. So did we go into the Georgian folly that is the normal viewpoint? Hell we did! we went over the sticky ice (really should patent that) and over the treacherous rocks which are bad enough in the summer but were all frosty and slippy at this time of year. But well worth it the place was beautiful, even from the very cold vantage point of lying on a very cold icy rock and dangling over the falls. Of course it gave the tourist something else to talk about and think we may have been photographed as much as the falls (“look at those stupid Scottish people trying to get themselves killed”). 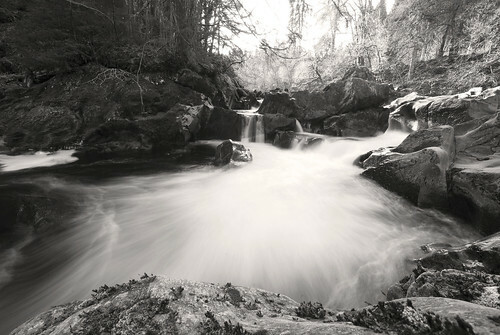 After shooting the main falls (Black Linn falls) we headed up river and down beside the blocks of ice that looked like they came out of the ice age we decided it would be a good idea to climb out onto the very impressive boulders to shoot a lovely smaller falls. These rocks were a bit slippery and as only Ian had a tripod I had to balance myself and camera on one of them and try and stay still to get the shot I wanted. Now it may look like I was in the middle of the river and that is because I was! Happy with the result I headed back and managed to get my foot wet which made climbing back over the slippery rocks even harder and by this time I could no longer see Ian (need to get walkie talkies!!!). Had images of us both being stuck on boulders in the very cold river. Maybe then the tourists really would have to fish us out! Fortunately I am excellent at climbing up rock from a almost certain death situation so I managed to get myself back onto more or less dry land! and found Ian clambering in from another angle. Nothing like dangerous photography to get the old adrenaline pumping and our new moto is “whatever it takes”. Do love our outings, always an exciting break to the normal safe day!